These boozy pops take the margarita out of the glass and puts it on a stick for a frozen and delicious treat. I add slices of lime and cucumber to keep it cool and refreshing. Before serving dust the frozen ice pops with a sprinkling of Tajin fruit seasoning to add a little salt and spice. You can't put too much booze in your ice pops or they won't freeze. This is a good thing. I find 1/2 cup of tequila to 2 1/2 cups of grapefruit freezes well. So how does one ice pop compare to one standard cocktail in terms of alcohol content? A U. S. Standard cocktail has .6 ounces of pure alcohol, or the same amount of alcohol in 12 ounces of regular beer or 5 ounces of wine. These ice pops have .16 ounces of alcohol per pop. So if I have done my math right you would need to eat 3.75 of these frozen treats to consume the same amount of alcohol in one standard U.S. cocktail. So go ahead and have two or three! The easiest way, of course is to take them out of the freezer and pop them directly into your mouth. But there is another way. These ice pops make wonderful garnishes for cocktails. Add these frosty treats to a Margarita, a Paloma or to a Mexican Mule for wonderful flavor and a beautiful presentation. To make a Mexican Mule combine 2 ounces of silver tequila with 6 ounces of ginger beer and a splash of simple sugar to taste. These frosty Margaritas on a stick provide a refreshing summer cooler eaten as is... or use them as a fancy garnish for Margaritas, Palomas or Mexican Mules. 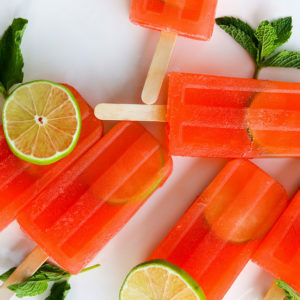 Place one slice of lime and one slice of cucumber in each ice pop mold. Combine limeade and tequila in a small pitcher and pour into ice molds. Place ice mold cover on top and insert wooden sticks into each ice pop. Freeze for four hours or overnight. To unmold, remove the mold from the freezer and run a butter knife under the cover to release the lid. The corners can be a little sticky. Pull the individual popsicles out of the mold. You can remove the ice pops from the mold, place them in a ziplock bag and return to the freezer to store until you are ready to serve them. When ready to serve sprinkle with Tijan spice. Pingback: 30+ Popsicle Recipes - FOR ADULTS ONLY!